Detecto’s USA-made waist-level digital physician scales with sturdy steel construction are available with or without a mechanical height rod. 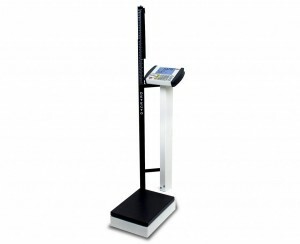 These scales are equipped with a MedVue indicator designed for optimum performance and utilizing Detecto’s unique 1LOOK feature which displays height, weight and BMI simultaneously onscreen while a patient is being weighed on the doctor scale. All of this data may be output to a printer or PC for efficient EMR/EHR via serial, USB, or optional wired or W-Fi Ethernet communications. 6 C batteries (not included) or optional AC adapter. 500 lb x 0.2 lb / 225 kg x 0.1 kg capacity.